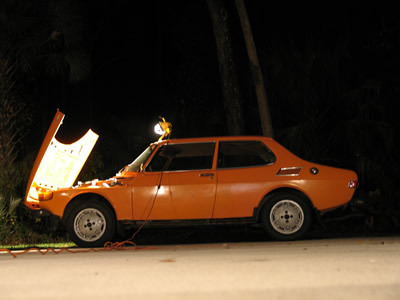 We’ve been getting a lot of work done late at night using a 500 watt worklamp and a long extension cord. With the nights getting longer, it’s dark here soon after 5pm. Garfield once again at work. 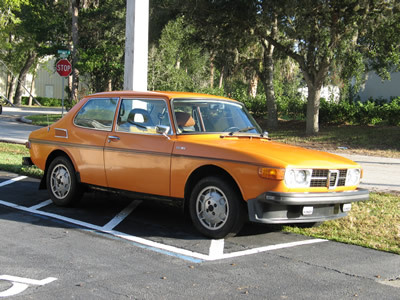 In one of our last updates for our “spare” Saab 99 we mentioned that we needed to replace the water pump. We finally got around to doing that this week. It’s a pretty messy job, requiring that the intake manifold and alternator be removed from the engine. 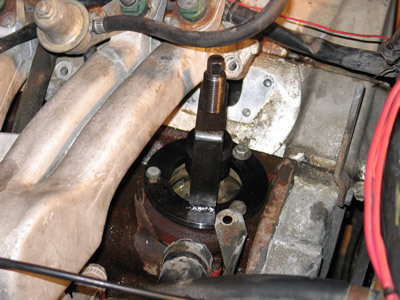 The Saab’s water pump needs to be pressed out of the block using a tool that we purchased from Pelican Parts. The tool was about $130. We drove the Saab in to work today. We’re still in the process of bleeding the cooling system so that there aren’t any air bubbles in there.